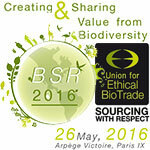 How the ethical sourcing of biodiversity creates value for natural ingredients and shares value among actors in supply chains is the theme of this year’s ‘Beauty of Sourcing with Respect’ conference, organized by the Union for Ethical BioTrade (UEBT) on 26 May 2016 on Paris. The international conference, now in its eighth edition, has become an unmissable event for companies sourcing specialty ingredients from the world’s rich biodiversity, for the cosmetics, food, and pharma sectors. ‘Biodiversity is an important source of innovation and raw materials in the beauty sector. The UEBT conference offers a unique opportunity to meet leading experts and stay informed about the latest developments around ethical sourcing of biodiversity’, says Bas Schneiders, Head International Strategic Sourcing at Weleda, one of the conference sponsors. This year the conference explores how companies are creating brand value through ethical sourcing of biodiversity. Leading brands like Natura Cosmetics, Weleda, Body Shop and Lu will be sharing their experiences and presenting their new strategies for the years ahead. A panel of experts will discuss how attention for ethical sourcing of biodiversity has changed over the last ten years, and what lies ahead. The panel discussion will be supported by new results of international research results - including the UEBT Biodiversity Barometer amongst 7,000 consumers in 7 countries - and interviews with various company representatives.